Snoring keeps millions awake night after night, and causes untold mental pain, relationship stress and illness due to sleep deprivation. People make lots of jokes about snoring, but if you are living with a loud snorer, it is no laughing matter. 1) Suffer with it, and keep missing sleep. 2) Change your sleeping arrangements. 3) Try to make the snorer stop. 4) Use ear plugs so you can't hear the snoring. 5) Try white noise sound masking so you can't hear the snoring. Making the snorer stop snoring usually isn't an option - and the pills, sprays, and surgeries that promise to put an end to that snoring are often not only ineffective, but sometimes dangerous, too! Ear plugs, white noise, and other solutions that focus on making it so you cannot hear the snoring, on the other hand, are highly effective and absolutely safe. We suggest you try a combination of the products listed below to find the one that works best for you. Everyone is different, so if one snoring relief solution does not feel good or does not work to your satisfaction, do not give up. Many snoring sufferers just like you have already found real relief. A pair of humble foam ear plugs, worn properly, is one of the most successful strategies to get relief from snoring, and we suggest you start there. However, if you have tried foam ear plugs without success, your unique snoring problem may call for a more advanced solution. You will find a variety of our most powerful solutions for relief from the most severe snoring below. (NRR 28) PROTECHS™ sleep ear plugs are designed to be comfortable and effective. They feature a contoured shape that makes these ear plugs fit easily and stay put in the ear canals throughout the night. Block out snoring and get a good night's sleep with PROTECHS™ Ear Plugs for Sleep. (NRR 30) Mack's Dreamgirl Soft Foam Ear Plugs are made specifically to fit women with small or sensitive ear canals. Ideal for sleeping, reading, loud events and travel. Block out snoring and get your beauty sleep. Pack of 10 pairs. 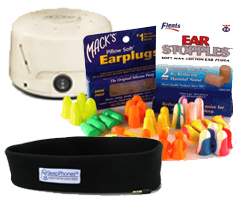 (NRR 32) Mack's Snore BLOCKERS Soft foam ear plugs are made with powerful, snore-blocking, super-soft foam. The unique hollow end maximizes comfort, especially during sleep. (NRR 32) Mack's SoundAsleep Extreme Comfort ear plugs are made specifically for sleeping with a snoring bed partner. (NRR 20) Ohropax Soft ear plugs are a soft, anatomically formed type of ear plug made of skin-friendly PU foam. This foam gently expands inside the auditory canal and reliably protects it against noise. (NRR 27) EarMuffers™ are like no hearing protector you have experienced before. EarMuffers™ ear plugs employ a unique peel and stick design. The soft, adhesive backed foam pads are used to gently press down over the ear canal opening. When you need the best protection you can get from a foam ear plug, and you are not sure what to choose, this assortment pack is the very best way to find which of the highest rated foam ear plugs works for you - at a significantly lower cost than trying all these different ear plugs separately. (NRR 29) Flents Quiet! Please Foam Ear Plugs are made of a firm but comfortable PVC foam that is easy to roll down prior to insertion. These ear plugs offer a secure fit and good noise blocking for sleeping, working, and more. Handy money-saving bottle of 50 unwrapped pairs. (NRR 33) Flents Quiet Time Foam Ear Plugs offer an excellent NRR 33, a tapered shape and soft structure making them an ideal sleeping ear plug as well as a great noise protection ear plug. Bottle of 50 Unwrapped Pairs. Got Ears?® Snoring Relief Kit™ is designed to help each person find the very best ear plugs for themselves. Our unique kit has 15 different ear plugs you can try including foam, adhesive foam, reusable, wax, and silicone putty, plus a premium quality Sleeping Mask. This high quality machine has it all: Interchangeable sound cards, fade out timer, headphone jack, large speaker, onboard battery compartment, wall or table mount, and low price. SleepPhones are soft headphones you can wear in bed comfortably! The super-soft fleece headband holds speakers in place so you can enjoy music while you sleep. The Sound Therapy S-650 features Sound Card Technology and high-quality white noise sounds, making this white noise machine ideal for sleep, relaxation, noise masking, concentration, tinnitus management, and soothing infants. Incorporating 18 digitally recorded sounds and a voice memo feature, Sound Oasis Travel allows users to drift off to sleep with soothing nature sounds and wake up to one of three alarm sound types (sound, voice memo or buzzer). Cover your bedroom in one of 15 different sound blankets with this smart at-home white noise system. Nightingale units plug in to create a blanket of custom-tailored white noise, blocking nighttime noises and helping with both tinnitus and snoring from adjacent rooms. Sleep better every night. As seen on Kickstarter. NewSound TI-100 In-Ear White Noise Sleep Aid offers a new level of comfort and performance whether you are trying to sleep with a snoring partner or deal with other disturbing night-time noises. One pair. As Featured in The New Yorker February, 2016.